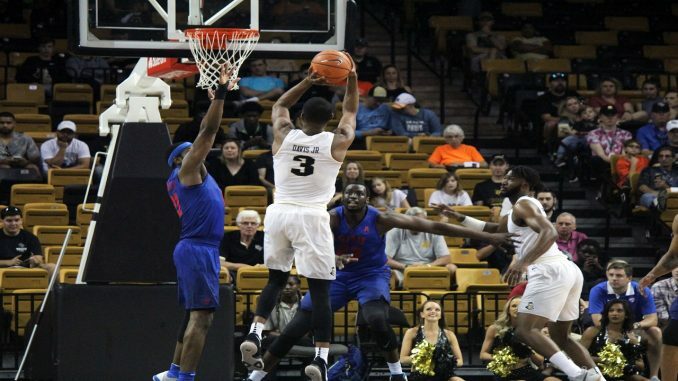 The UCF Knights defeated the SMU Mustangs 52-37, as redshirt senior A.J Davis continued to be lights out on offense in an important home win at the CFE Arena Saturday afternoon. Davis, who has been instrumental in the Knights’ (17-9, 8-6 AAC) final stretch of games in the 2018 regular season, scored 19 points and tallied 10 rebounds. Davis was 4-7 from beyond the arc, and hit 46 percent of his field goals. But the Knights also saw a solid offensive performance from redshirt junior Dayon Griffin, who scored 10 points. But offense was only half the battle, as the Knights also tied their own record for lowest points scored by an opponent in program history. The Mustangs (15-12, 5-9 AAC) struggled with junior Shake Milton out for his fifth game in a row. The Mustangs failed to keep up with UCF all game, falling behind early as they trailed 13-1 in the first half at one point. Ben Emelogu II led SMU with 12 points on Saturday, shooting only 30 percent from the field. The Knights, who shot a team 38 percent on 17-45 shots from the field, will continue to ride its three-game win streak as they travel to Tulsa. UCF is one spot behind Tulsa in the AAC standings, currently holding the fifth slot in the conference. After Tulsa, the Knights will battle Temple and then No. 19 Wichita State, who currently is in third place in the AAC.